The 80th South African Museums Association (SAMA) Conference took place in Pretoria from November 1 – 3, 2016. It was a privilege to be there and witness the commitment and dedication of so many museums professionals to their profession and their community. 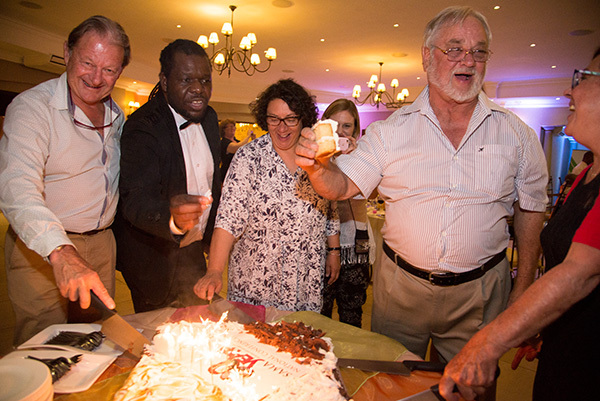 At the banquet on the final evening, all surviving Presidents of SAMA were invited to attend and be part of blowing out the candles on the 80th birthday cake in celebration of a significant achievement. Here is a gallery of pictures that were taken at the conference which you are free to download free of charge for your own use or for use by your museum: SAMA National Conference 2016. Cutting the SAMA 80th Birthday cake. South African Museums Association (SAMA) National Conference 2016 was held at Diep in Die Berg in the East of Pretoria from November 1-3, 2016 and included visits to Freedom Park, Fort Schanskop, Maropeng and the Cullinan Diamond Tour. The event also marked the 80th anniversary of SAMA and all surviving past presidents were invited to the banquet on the closing night as part of the celebration. One paper presented at the conference that really struck a cord with me was by Bonginkosi “Rock” Zuma who argued eloquently that South Africa should aim at being an intercultural society rather than a multicultural society. This is the right kind of thinking for nation building – forging new identities in the wake of dealing with the inequalities of the past and seeking to build a united society where we are on the road to realising the ideals contained in the Freedom Charter. There was significant discussion at the conference about the role of Museums in this nation building, helping our people to deal with the past and move on into the future as a united people. Certainly, museums, along with the Media, are powerful institutions in this process if the mandate is taken seriously. On the “Day of Reconciliation,” (December 16) I was listening to a debate on SAfm. It was a discussion about race relations in South Africa. The question was asked by one caller: “Where are the White people who are reaching out to their Black neighbours?” He went on to say he personally knows of no one, and he does not see any examples in the media. I thought to myself, how tragic. It is tragic on two accounts. Firstly because it is true, so many in South Africa can live their whole lives without having a positive interaction with a White person. And secondly, because those White people who do reach out to others are indeed hidden. 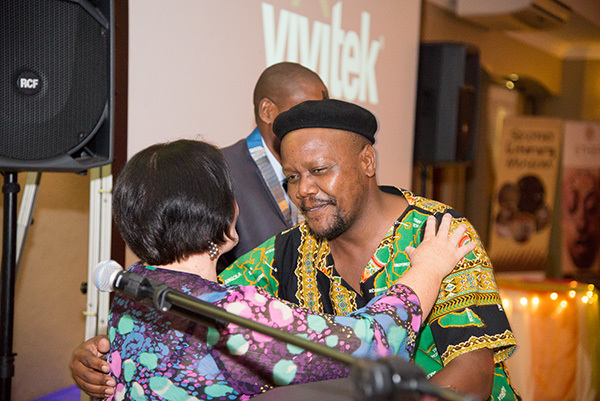 Bonginkosi “Rock” Zuma receiving an award at the SAMA Conference banquet from Riana Mulder. I suspect that what Bonginkosi was saying plays a significant role in why the caller had never experienced a really positive interaction with a White person in South Africa. Apart from the overtly racist White South Africans, who are given high visibility in the media, whenever they are exposed, in my experience the vast majority of White South Africans, particularly middle and upper-class English-speaking White South Africans, are happy to pursue the vision of a multicultural society where different groups exist side by side, interacting at the points of necessity, such as in the marketplace, as long as the interaction does not require us to change in any way. We are happy for people of other race groups or cultures to be included in our social swirl as long as the person went to the “right” school or tertiary institution, earns the “right” level of income, and knows how to conform to the social mores of our clique. In other words, you can become one of us if you have what we have and behave like we do. If you are not part of our circle the best of us will interact with you as poor souls who need a leg up in some way, and the worst of us will simply use you as means to the goal of accumulating as much wealth as we can to increase our standing among our peers in our social class! The T-Shirt says it all! 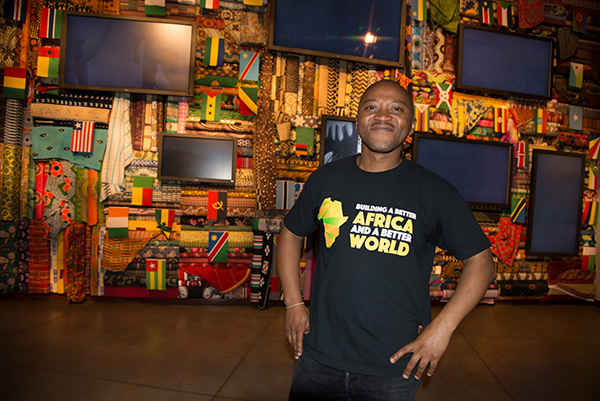 Mlungisi Shangase from the Durban Local History Museums at the end of a tour of Freedom Park as part of the South African Museums Association (SAMA) National Conference 2016 was held at Diep in Die Berg in the East of Pretoria from November 1-3, 2016. Of course as with the middle class the World over, for this group, this is less a matter of race than a matter of class. In fact, quite often, someone of the same race group, who is not of the same class, is even less acceptable than someone from another race group who is of a different class. The latter can become a curiosity, the former has no redeeming attributes! Upwardly mobile South Africans of all races understand this. I meet as many White South Africans making great sacrifices to get their children into leading private schools (the more expensive the more status) as I do Black South Africans. Belonging in the global middle class is about being associated with institutions of prestige and immersion into the “acceptable culture” those institutions nurture. Wealth alone and the right address will not buy you acceptability, and with acceptability, the wealth of opportunities that come with it! Fort Schanskop beside the Voortrekker Monument was the venue for one of the outings at the SAMA Conference 2017. The fort was built as part of a series of forts to defend Pretoria after the Jameson Raid. For centuries now, South Africa has been a contested space, particularly over access to land and mineral resources. Greed has lain at the heart of most of South Africa’s historic conflicts, and it is no less so today. So perhaps we need to push Bonginkosi’s interculturalism further and speak about interclassism. I hardly have to be a prophet to predict that the vision of an intercultural and interclass society where members of different cultures and class groups interact as equals and are willing to change and grow toward one another, sharing resources and opportunities and forging a new identity that is shared to a greater or lesser extend, will be perceived as greatly threatening to middle and upper class South Africans of any colour. For many such privileged people in this country, if talk goes in that direction, they will leave… because they can… and because they honestly believe it has been their hard work and skill that has enabled them to accumulate the wealth they have. They tend to overlook the fact that for many of them the looting and plundering of colonialism, apartheid (and to a not insignificant degree in the post-apartheid era) has set them up for the privilege they enjoy. You do not have to study news reports on the new political elite for long to discover that protecting wealth and privilege is not behaviour unique to Whites. Of course, those who are “in” are not “in” on the basis of their school tie, but on the basis of their struggle credentials. As with any elite, the World over, they too can be seen to change the rules to maintain their privilege and power. One of the groups of young people from all over South Africa and other parts of the World with whom we played “The Power Game” as part of a programme called the Frontier Year Project. African Enterprise once developed a game that we used to play with students we were teaching. The “Power Game” was a trading game where participants traded imaginary resources. After the first round, they were divided into three groups according to the number of resources accumulated, Group 1 being those who had accumulated most, Group 2, those who had accumulated less and Group 3 those who had accumulated the least. Another round was played and the groups reshuffled again based on the results. Then in Round 3, Group 1 was given the ability to change the rules of the game. Without fail, every year that we played the game, we saw the same patterns emerging no matter the background or culture of the students. Group 1 would change the rules to maintain their position of privilege and power. Group 2 would seek to club together to get one of their number to succeed in breaking into Group 1 to bring reform to the rules. Of course, when that person got there they could not change the rules and more often than not they were coopted into the “winning” attitude of Group 1. And Group 3… well Group 3 gave up, or began to protest and refuse to engage in the game. Welcome to the inherent power relations within the global economy, and the South African economy in particular. Only, here in South Africa, it is accentuated because the groups are arranged along racial lines. No wonder 23 years after the end of apartheid nothing much has changed. And on the whole Group 1 will see no need for change and will wonder what Group 3 – students, the poor and the workers – are going on about! 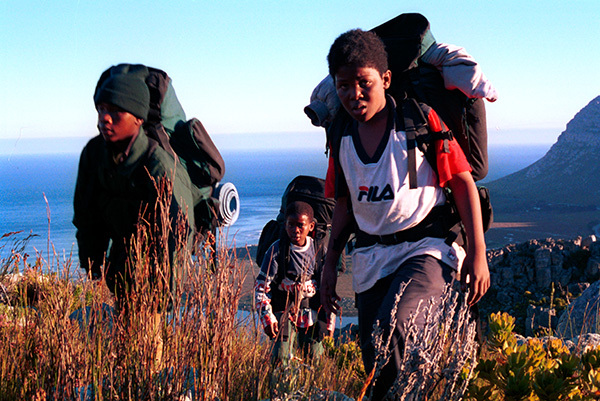 Children from Mseki Primary School in Guguletu township in Cape Town on a “rights of passage” weekend in the mountains above Kleinmond. My wife, Rosanne, taught at the school for three years. The majority of children had no fathers and this “rights of passage” weekend was part of a number of interventions. We still maintain contact with some of her pupils 20 years on. That is not the end of the story, however. Every now and then, while playing the Power Game with students, we came across a student who had made it into Group 1 who fought hard to change things. Mostly they quickly found themselves sidelined and dropped into Group 2 and even Group 3, but on occasion, they made an impact in some way or another. This brings me to the second reason the SAfm caller’s testimony of not knowing of one case in his life or in the media where a White person reached out to a Black person is tragic, is because all over this country there are many who are doing so, often at great cost to themselves. And this is not just about White people reaching out to Black people but people of any colour not being content to keep the life of privilege to themselves, but being willing to sacrifice to see others uplifted. Shareholder in Africa Media Online, Rouen Bruni, is a homeopath who started an organization providing care for families infected and affected by HIV/AIDS in the KwaZulu-Natal Midlands. I know many of these people. People who stood against apartheid at great cost to themselves, even when there was no incentive to do so – because they were actually privileged by it, yet they fought against it because they believed it to be unjust – and people who in the post-apartheid era have stood for justice, particularly for the disenfranchised and the vulnerable. 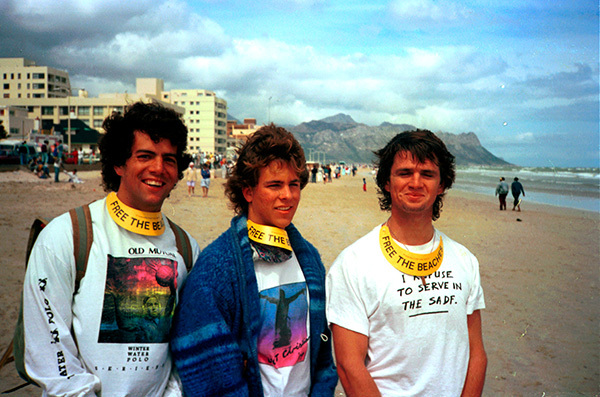 Craig Stewart, me and Henri van der Merwe at a beach demonstration at the Strand in 1989 led by Alan Boesak. We were students at UCT at the time. 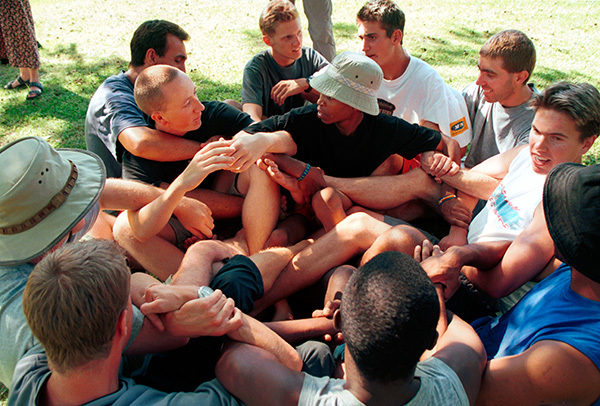 Craig recruited students to teach in the Khayamnandi Boys Home in Langa, Cape Town for the Baptist Student’s Union, which I was involved in, and went on to found The Warehouse, an NGO that tackles poverty and injustice in Cape Town. I once worked with Charlie Bester who went to prison for a number of years because he refused to take up arms against fellow South Africans and serve in the SADF in what he believed was an unjust war. Angela Kemm worked for years in solidarity with a squatter community in KTC. Together, their effort eventually won the Tambo Square community land and houses in the buffer zone between Mannenberg and Gugulethu in Cape Town, a community now called Tambo Village. 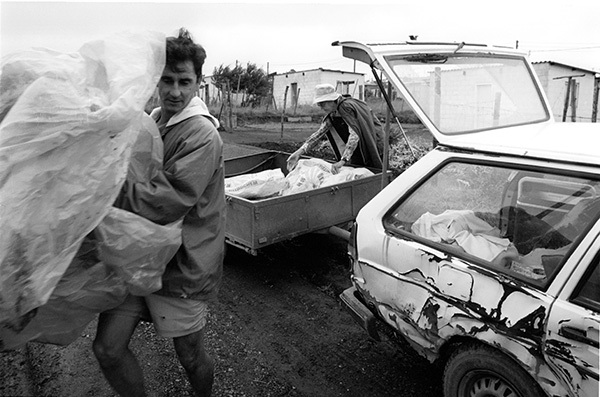 Piet Dreyer gathered over 50 churches in Pietermaritzburg in the early 1990s to respond to the refugee crisis created by the Seven Day War between Inkatha and ANC in the Edendale Valley. Their feeding scheme was eventually feeding 40,000 people a week in the greater Pietermarizburg area and the organisation, Project Gateway continues to this day to provide job skills development and access to markets for peri-urban communities. 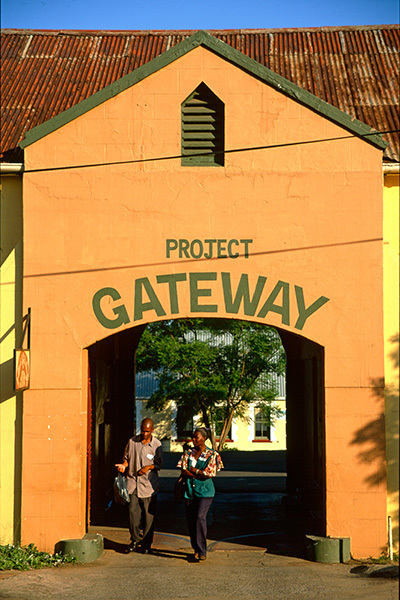 Project Gateway is resident in the Old Prison in Pietermaritzburg. For over two decades it has played a pivotal role in the city in mobilizing churches, businesses and community organizations on behalf of vulnerable communities in and around the city. I am a trustee of an organisation founded by Benson Okyere-Manu, a Ghanaian. He pioneered Community Care Project to assist those affected and infected by HIV/AIDS working with tens of thousands of young people in KwaZulu-Natal. Suzannah Farr started an organistion called Generation of Leaders Discovered (GOLD) to help vulnerable youth reach their potential. Annette Ntombiyenkosi Muchache (nee Landman) from a conservative Afrikaans Northern Transvaal farming family left the SADF to work among the rural poor in Northern KZN and then in southern Mozambique adopting several children of various colours, starting three schools and an orphanage for children affected by the war in Mozambique and eventually marrying a Shangane man. Together with Bridget Walters she started Nansindlela Primary School in Ingwavuma which over the decades attracted many teachers who had graduated from top universities, to teach in that rural community. Every year the top 50 places in the Dusi Canoe Marathon are dominated by young men from the Valley of a Thousand Hills who are beneficiaries of Martin Dreyer’s efforts to raise up World class athletes in the Change a Life Academy. And this is to say nothing of the many, many families I know who have adopted children across the colour bar. The point is that South Africa is full of many amazing people of all colours who are doing exceptional things, often at great cost to themselves, to build a humane society in which all South Africans are treated with dignity and respect as articulated in the Freedom Charter. It is true, these stories seldom make the headlines – good news seldom does! A politician mouthing off in a divisive way, is far more emotive, and so sells more newspapers than a middle-aged couple from your community who has decided to adopt a child, found a few days earlier in a pit latrine, as their very own – giving two to three decades of their life and the resources to match to nurturing the child. Or the grandmother with meager resources who dedicates what should be her retirement years to raising her grandchildren because the parents are deceased or absent. I documented the work of my father, Dr JV Larsen MBchB (UCT) F.R.C.O.G. 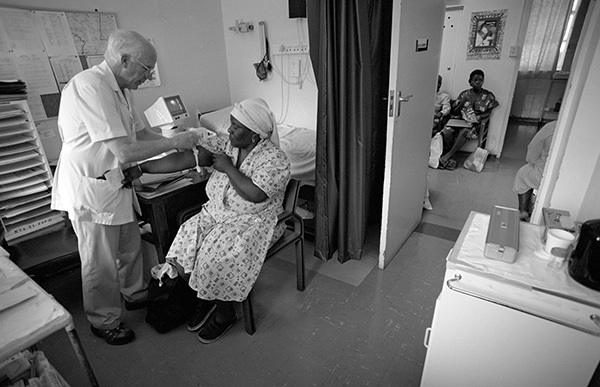 in his final week at Eshowe hospital having worked as an obstetrician and gynecologist for 40 years among rural women. In order to ensure an integrated health care referral system for pregnant mothers in Zululand, he chose to work part time for KwaZulu Health and part time for Natal Provincial Administration. While that decision, along with such sacrifices by his colleagues, saved the lives of literally hundreds of women and babies, (the infant mortality rate in the region dropped dramatically over the decades of their service), it came at a personal cost – part-time staff do not get pensions like their full-time colleagues – a cost he knew about at the time, yet was prepared to pay for the sake of others! In his retirement, to sustain himself and my mother, he began to work at the Howick AIDS Clinic for a number of years. Now, however, in spite of being in his mid-70s, he is back bringing his half-century of experience to working as a consulting obstetrician in rural clinics in the KZN Midlands. These, however, are the ordinary heroes among us who are daily living out the promise of the new South Africa. Certainly, the media and the heritage community, particularly museums, have a significant role to play in highlighting these stories as an inspiration to us all, stories gathered from the tens of thousands of South Africans of all colours who have not stopped short at multiculturalism, but have pressed on to the greater goal of interculturalism and even interclassism.